Welcome to the inaugural post of SAFN’s new Food Anthropology Program series. We will feature an undergraduate or graduate food anthropology program in each post. If you would like to participate, or would like to nominate a food anthropology program for the series, please email the series coordinator, M. Ruth Dike. The anthropology of food has been taught at SOAS, University of London since the mid-1980s. For many years, this took the form of an optional class available to BA and MA students, which was taught by Professor Johan Pottier. The class reflected Pottier’s research interests in Central Africa, including the study of famine, armed conflict, refugee migration and the disruption of food markets. When Professor Harry West joined the department in 2003 he was embarking on food-related research with a focus on artisanal cheese making, the notion of re-embedding food systems in locality and the emergence of ‘heritage’ foods. Concurrently Doctor Jakob Klein—who had recently finished his PhD at SOAS and was beginning to lecture in the Anthropology Department—continued to work on the transformation of regional cuisine in the People’s Republic of China. These three academics were interested in learning more about each other’s research, and over time decided to collaborate to develop a full-unit class in the anthropology of food, which combined their diverse interests. Originally the class was open to postgraduate and undergraduate students, but as demand grew availability was limited to MA students only. From 2007, this class became the core of a full master’s programme in the Anthropology of Food. 2007 also saw the inauguration of the SOAS Food Studies Centre, which has developed strong links with an international network of food researchers, and attracted academic speakers such as Sidney Mintz, James L. Watson and Melissa Caldwell, and food writers and chefs including Claudia Roden and Yotam Ottolenghi. Restauranteur Yotam Ottolenghi gave a Distinguished Lecture in the SOAS Food Studies Centre in November 2014, to the delight of centre members and SOAS alumni. As well as hosting lectures, workshops and conferences, the Centre holds a weekly Food Forum during term time. This research seminar is designed to complement the structure of the anthropology of food course, giving its students an opportunity to engage with people active in food-related scholarship, businesses and activism. West is currently Chair of the Food Studies Centre. Klein is Deputy Chair. The Centre currently has 47 members and an additional 803 associate members. The MA in the Anthropology of Food covers a broad range of topics and approaches food at many different scales, ranging from the body, to the household, the nation state and the global food system. Ethnographic examples are drawn from all parts of the world and discussed in a seminar format. Although grounded in anthropology, the syllabus explores different disciplinary perspectives including historical, scientific, nutritional, geographic and economic amongst others. While Johan Pottier has now retired, Harry West and Jakob Klein continue to co-ordinate and teach the core course. The MA programme, directed by Harry West, currently has an annual intake of around 25 students. The programme attracts a diverse range of students of different ages, nationalities and professional/academic backgrounds. The programme can be pursued full-time over twelve months, or part-time over two or three years. Around a third of students take the part-time route. The MA is made up of four modules – the core course in the anthropology of food, a dissertation of 10,000 words and two other options (or as many as four half unit options). For those who have not studied anthropology before, one of these is filled by a compulsory course in theoretical approaches to social anthropology. Option courses are available in the Anthropology Department as well as others such as Politics, Economics, Development Studies, Law, Religion and Languages. Students also audit a course in ethnographic research methods in order to further prepare them for their dissertation. 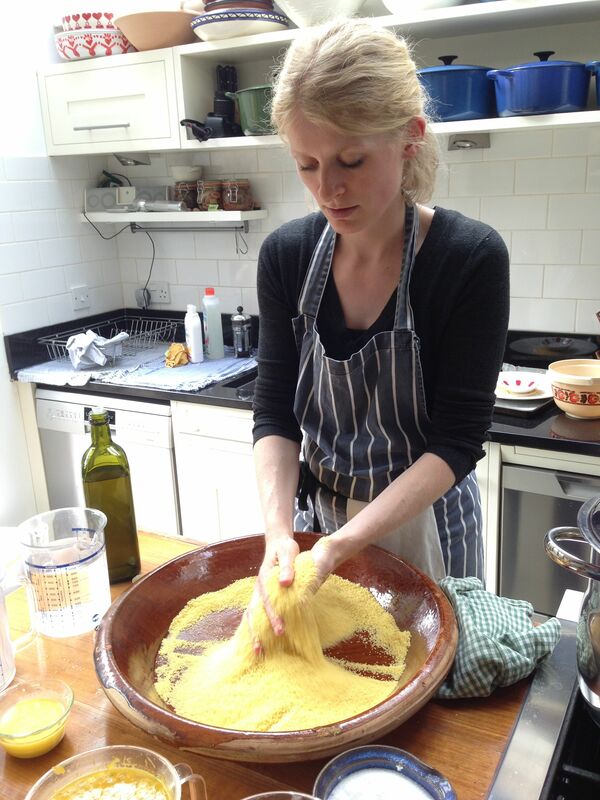 Doctoral student Katharina Graf, who studies how cooking knowledge is passed down in Moroccan households, prepares couscous for an ethnographic dinner. In addition to the passion that West and Klein have for their subject matter, one of the many strengths of the programme is its location in London, which is home to a broad range of alternative food businesses, NGOs, food purveyors, media organisations and other food-related activities. This is reflected in a half unit option which is available to students on the MA – a directed practical study in the anthropology of food. Students taking this identify an institution, organization or enterprise in which to work as an intern. The combination of work experience, directed readings and reflective written assignments allows students to bridge the divide between theoretical and practical concerns, and in many cases helps students to reflect on their future career paths, while expanding their relevant networks. Alumni of the course have gone on to work in a broad range of food-based jobs, details of which can be found on the food studies alumni profile page. Celia Plender is an alumna of the MA Anthropology of Food and current doctoral student in the Department of Social Anthropology at SOAS studying consumer food co-ops in the UK under the supervision of Harry West.